In 2016, we saw the insanity of Dakar in India and after completing two editions of one of the most challenging rallies in India, the 2018 edition is back and is scheduled from August 17 to August 19 in Jaisalmer, Rajasthan. TVS Racing – the factory racing arm of the bike maker – will compete in the 2018 edition for the third time and has announced a six-rider squad who will compete in the Indian Baja. The squad includes Lorenzo Santolino from Spain, R Nataraj, Abdul Wahid Tanveer, Harith Noah, Imran Pasha and Rajendra RE. 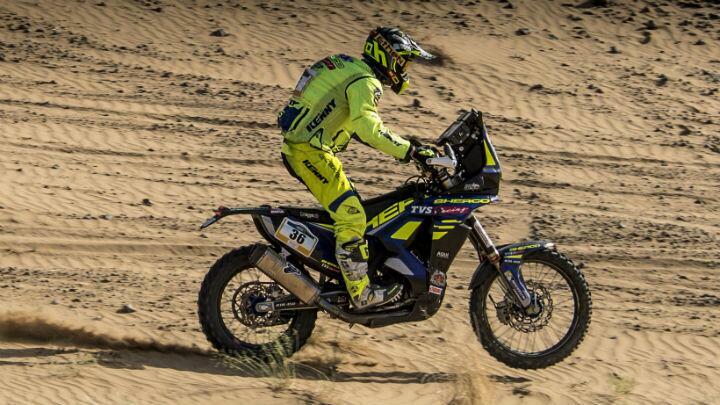 The six-riders who will represent TVS at the 2018 Indian Baja bring a lot of experience to the table. For example, Lorenzo Santolino bagged a podium finish at this year’s Desert Storm Rally, R Nataraj is an eight-time national champion, Abdul Wahid has three championship belts under his name, Harith Noah is a seven-time national champion, Rajendra RE a six-time national champion and the new member on board, Imran Pasha, with one championship to his credit. The squad will be riding the RTR 450 FX. The 450cc, four-stroke motor produces around 60bhp and is mated to a six-speed sequential gearbox. The RTR 450 FX is built around aluminium, double cradle frame and the entire bike weighs just 135kg. The motorcycle is equipped with fully adjustable WP suspension at the front and back (11.81-inch of travel up front and 13-inch of travel at the rear). The bike uses hydraulically activated Brembo brakes at both ends (300mm at the front and 220mm at the rear). And if you want a taste of how the RTR works, then click on these blue words.